You just sent out a campaign to your email list. You are waiting for their response but you haven’t received any. You might be wondering what happened. There is a good chance that your mail has been landed to the spam folder of the receiver. Now you must be wondering why your emails end up in spam? Let’s find out. These are the most possible reasons that could result in landing your email into the spam box. The primary rule of email marketing is to take permission to email first. To get this permission you need to have an opt-in form that makes perfectly clear that your customers are subscribing to your email list and what kind of emails can they expect from you. If you add the emails to your list without their consent you are violating CAN-SPAM Act and GDPR regulations. This is one of the simple reason that the email recipient has marked your email as spam. This happens if your content is not relevant to your subscribers. And sometimes they mark your email as spam if they don’t remember subscribing to your email list. The side effect of too many spams is it could damage your email reputation. There is a great chance that your IP address is used by someone else to spam. I mean if you have used an email marketing service, your emails will be delivered through which are shared by other senders as well. If any other customer sends spam, it will affect your emails. So choose an Email Marketing platform that offers a dedicated IP address. This might cost you more, but it is definitely worth the investment. These type of subject lines make the recipients open your email. But once they found it irrelevant they will mark it as spam. If you are sending too many emails, then there are good chances that your emails might be flagged as spam by email service providers. Ideally, you should not be sending promotional emails more than once a week. When your customers are not opening your email that will result in a low engagement rate. This makes the email service provider flag your email as spam. To fix this, you can create personas of users and only send emails relevant to them. For example, if someone purchased trekking shoes from your website, they might be interested in knowing when you launch new trekking gear. But they may not be interested in Makeup. At the end of the email, you must include your physical address. It will improve the trust among your customers. The absence of address at the end of email might make your customers feel suspicious and resulting in marking your email as spam. 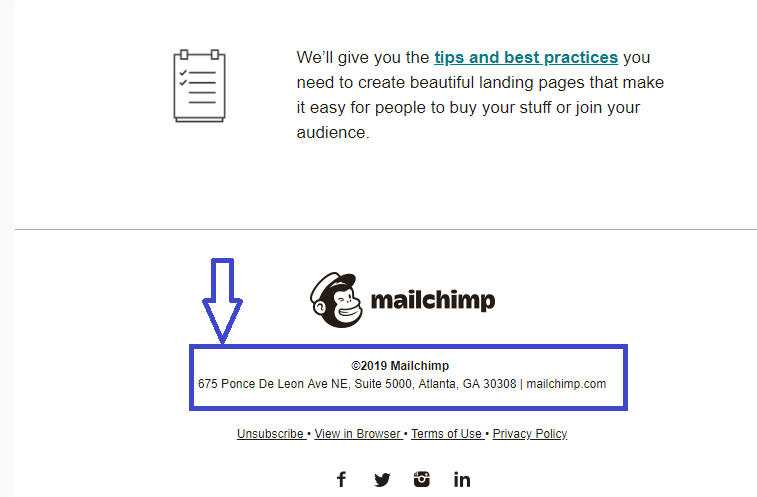 You can see below example MailChimp email, they mentioned their address at the bottom of the email. There is a popular saying that you can’t build a house without doors. Same applies in the email marketing, According to GDPR regulations, you must include an unsubscribe link at the bottom of your email. These are the major reasons that could result in landing your email into the spam folder. If you can be careful about these points you can succeed in Email Marketing.